It's pretty clear that a rock hyrax does NOT look like an elephant ! 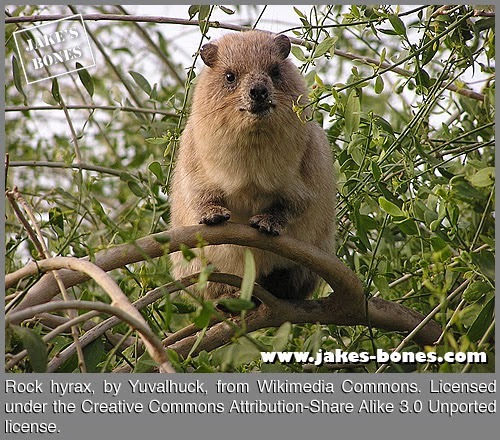 So what is a rock hyrax anyway ? The rock hyrax (Procavia capensis) is a pretty amazing and slightly strange animal that lives in Africa and in the Middle East. Adults can grow up to 50cm long and can weigh up to 4kg - which is cat sized - and they have thick brown fur which covers their body and have they have whiskers like a cat. They are group animals that live in large families, that feed together and post lookouts, similar to how meerkats live. 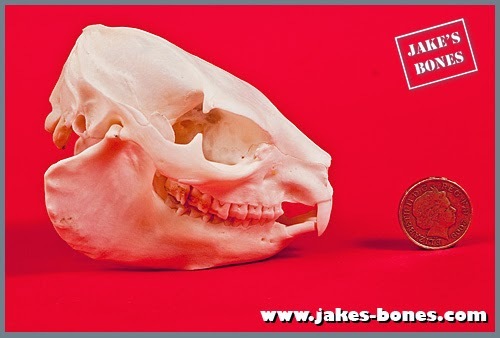 Teeth tell you a lot about what an animal eats, and it's pretty obvious that the rock hyrax's teeth are quite different from canids or felines. At the front they have the two long "tusks" of teeth, which look like an elephant on the skull, but are hardly visible in the living animal. 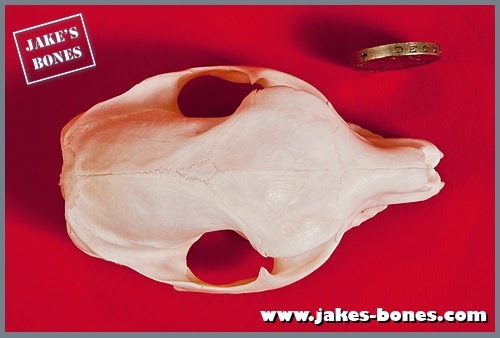 I took out one of the long incisors, and it is very similar to the incisors on a rabbit, in that it is very long inside the skull, so that it constantly wears down and regrows at the same time. 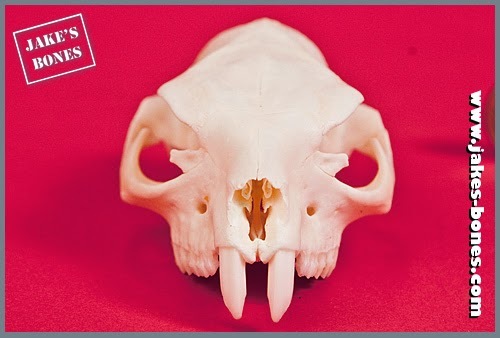 That means on the top row of teeth, going from the mid-point at the front of the skull and working back, it has 1 incisor, no canines, 4 pre-molars and 3 molars per side. On the bottom it is 2 incisors, no canines, 4 pre-molars and 3 molars. 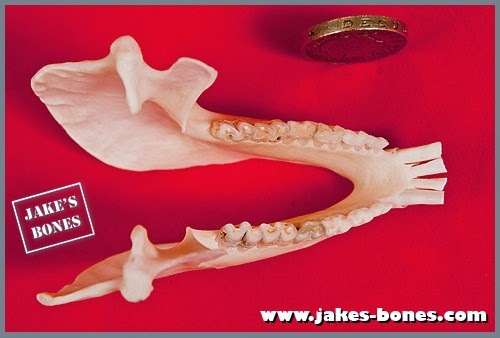 The pre-molars and molars look very similar, getting progressively bigger towards the back of the jaw. Here you can see the bottom jaw. It may seem odd that the bottom jaw has a different number of incisors, until you remember cows, sheep, and deer all have bottom incisors, but no top ones. 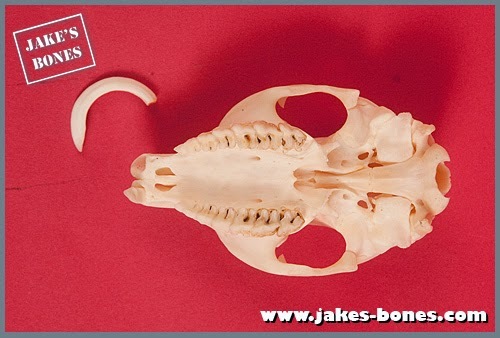 This skull is slightly under 10cm long, and the top part sits at an angle when on the lower jaws because the back part of the jaw is incredibly thick. I've never seen a jaw quite this thick at the bottom edge before, although horses are slightly similar, and I think it's because it's a good adaptation for grinding. If it meant it had a strong bite, it'd have a ridge on top of the skull - a saggital crest - for the jaw muscles to attach to. From the back you can see how deep the jaw is. 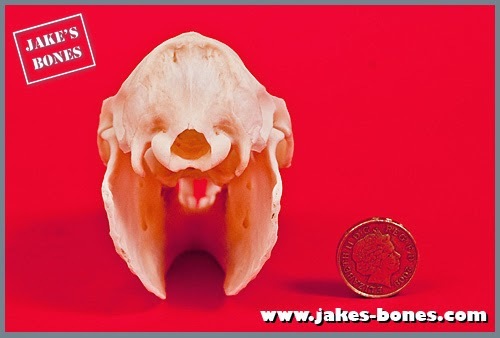 This is very unusual and from the side reminded me slightly of a howler monkey jaw, although the howler monkey has a very special adaptation for that, which is different when seen from other angles to the rock hyrax. Here's the top view. As I mentioned before, since it is not a meat eater, it does not need strong jaws, so it does not have a saggital crest. The tiny plate in the middle is unusual. as is the narrow snout, which is presumably so it is better at finding insects and food. It's slightly armadillo-like from this angle. 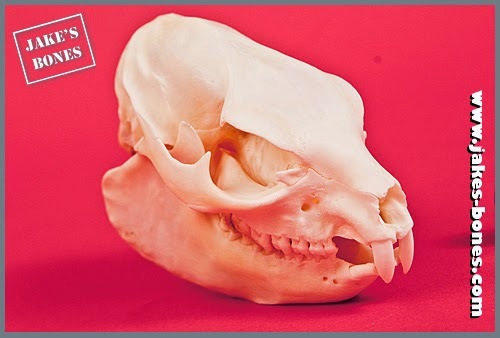 So the rock hyrax skull looks a lot like a lot of other skulls in part: there are bits that look like horse, howler monkey, sheep, rabbit, armadillo, and elephant, even though it isn't really like any of those other creatures, and I think the similarities are sometimes coincidences. It's amazing that an animal so common in Africa is so different from all the others, and it shows you even the most common animal can have amazing features. A BIG thank you to Philippe from Blue Duiker for sending this to me ! There was also a second skull in as an extra present, but I'll write about that another time ! They seem really nice people.